In January 2010 I was a freshman at Chief Sealth High School. This was also when I first found out about the Service Board. I applied and got accepted to be a prophet, I remember being completely terrified to have to meet with random people I didn’t know twice a week until June. But over the course of only a few months, I gained another family. I felt like I could be myself in the tSB community, that I was loved, and accepted for who I am. It was such an awesome feeling! I loved tSB so much that I decided to apply to become a Peer Leader the following year. Once again I was excepted! In 2011 I was trained in a leadership role where we pretty much took charge of most of the program nights. Being a Peer Leader really gave me that extra confidence boost that I needed. I felt more comfortable speaking in front of people, I knew what to do in awkward silences, and I learned how to lead youth and mentors! 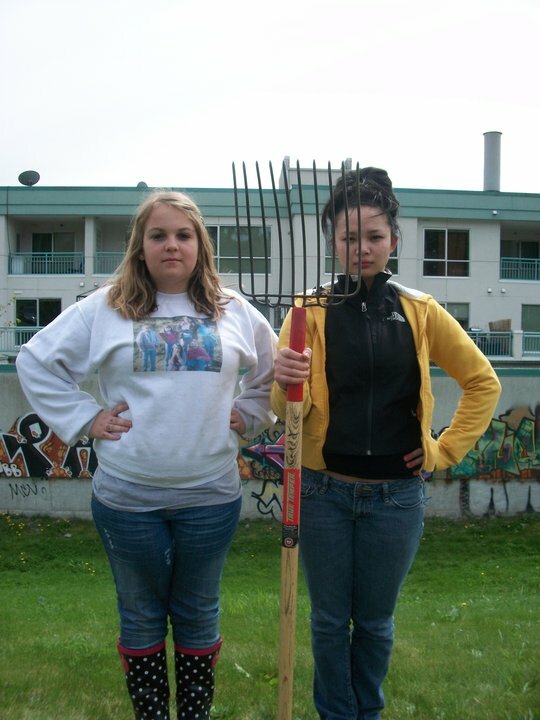 Me and Lai reenacting American Gothic at Ground Up Yesler in 2010. Once the 2011 graduation ceremony came, I was devastated, because this meant no more tSB! I knew how busy I would become the next year academically going into my junior year, so I had to make the decision to not participate in the 2012 tSB program. When I was not going to program nights every week, it was then I had realized how much I really got from the Service Board. They honestly taught me to be myself, and that it was okay to be different because normal is boring. This year I am a senior and am on track to graduate from Chief Sealth this June. Every senior has to complete a senior project in order to graduate. Our project has three components to it, the first is a 25 hour project that we come up with, the second is a 1,500 word research paper related to our project, and the final one is a 12-17 minute presentation. For my senior project I have decided to job shadow the executive director of the Service Board, Ashley Miller! I was interested in shadowing Ashley because I wanted to see how this program is kept alive, how funds are raised for the program year after year, and see what it takes to become the executive director of a non profit organization! So ya’ll will be seeing me around the office a lot more often!